Aside from my mom's enchilada recipe, this is the next best recipe in my opinion. I found it on the foodnetwork.com when we first got married. 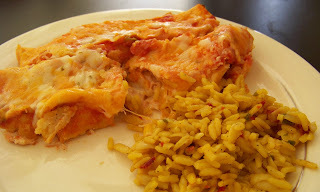 I like that it provides a little twist on a traditional enchilada. It's delicious! - In a medium bowl cream together cream cheese and sour cream. Stir in 1/2 c. salsa. Stir in 1 c. grated cheeses. - In a second bowl toss together the chicken, corn, cumin, cayenne, salt, pepper, and 1/2 scallions. - Add the chicken mixture to the cheese mixture and stir to combine. - In a baking dish spread 1/2 c. salsa over bottom. Place about 1/3 c. filling on a corn tortilla, roll up and put in dish seam side down. Repeat process for remaining tortillas. - Pour remaining salsa over enchiladas, spreading to coat all of them. Sprinkle with remaining cheese. (Enchiladas may be prepared up to this point 12 hours in advance) - Transfer to preheated oven and bake 20-25 minutes until hot and bubbly. Sprinkle with the remaining scallions and serve warm.